Formerly the churchyard of the original All Saints Church (which was demolished in 1865 and moved to Jesus Lane), All Saints Garden is now an open space which contains a memorial cross and hosts a weekly art and craft market. 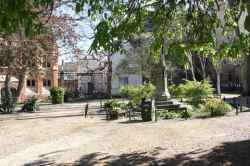 Based in St. Johns Street, Cambridge, All Saints Garden is a landmark. All Saints Garden is in St. Johns Street Cambridge. You can view a list of neighbouring businesses by going to the St. Johns Street page. Note: the pin is positioned at the postcode centre, and may not correspond with the precise location of St Johns Street.